Do you love good, warm, comfort food on a cold winter's day? I sure do! In fact, adding soups, stews, chowders, and comforting casseroles to the menu is one of my favorite parts of winter. My absolute favorite recipes to warm us up are those that combine great flavor with affordability. 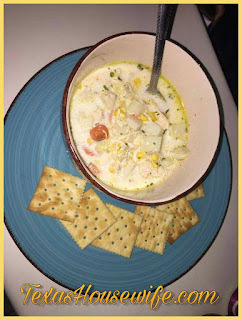 This creamy chicken chowder recipe was thrown together by raiding my pantry and turned out to be a bowl of rich, delicious comfort food. Not only is it tasty, but it comes together rather quickly, making it a great choice for a weeknight dinner. I hope your family enjoys it as much as mine does! 1 lb boneless skinless chicken, cooked and shredded - Thighs, breasts, whatever you want to use works! 1 teaspoon minced garlic - I use the refrigerated stuff in the jar. 6 cups chicken broth - I've used broth reserved after boiling chicken, store bought broth, and even water with chicken bouillon successfully. 2 cups half and half - You can sub milk with no problem, your chowder just won't be as rich. In a large pot, stir butter over medium heat until melted.Toss in onion and garlic, stirring and cooking until tender. Add in flour, stirring constantly until slightly browned, to make a roux. Pour in broth and continue stirring until well blended. Add carrots, potatoes, and seasoning, let the pot come to a boil. Lower heat to medium low, cooking about 20 minutes or until vegetables are tender, giving the pot an occasional stir. Stir in corn, half and half, cooked chicken, and corn. Reduce heat to simmer and cook another 15 to 20 minutes, stirring occasionally. This is one of those recipes that you can add to and/or take away from depending on your tastes and what ingredients you have on hand.